Fill your house with rich aroma of ranch chicken and potatoes. Heat oil over medium high heat. Season both sides chicken. Place chicken skin side down. 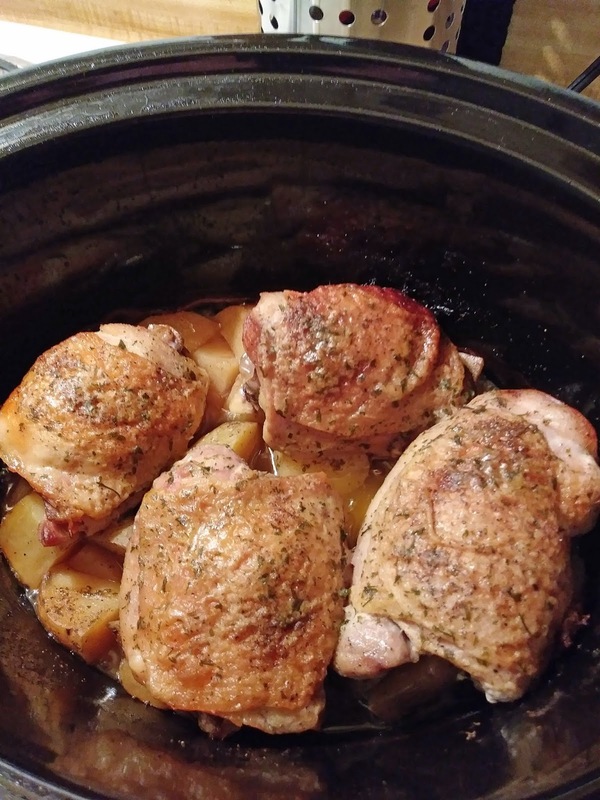 Sear chicken 3 to 4 minutes. Turn heat off, sprinkle chicken with black pepper and garlic powder. Spray cooker with non stick cooking spray. Add potatoes, sprinkle with salt. Place butter on top of potatoes. Add chicken, sprinkle with ranch seasoning mix. Cover, cook on high, 4 to 5 hours, until chicken is cooked through and potatoes are tender. what a great idea for the slow cooker and perfect side dish! It is a great main dish. Thanks, Claudia. I think I cook chicken at least once a week and am always looking for inspiration This recipe looks delicious!